If the goal of criminal investigators is to save time during a crime scene investigation this forensic laboratory aid provides just this. This does provide the necessary reassurance that the proper investigative agents are being utilized for accurate analysis of evidence. 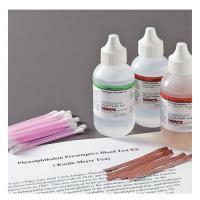 The Lightning Powder phenolphthalein presumptive blood test kit provides that time savings and accuracy for investigators. This test unit allows for investigating field officers to perform approximately 30 tests utilizing pre-mixed chemicals and other necessary reagents. While this kit can't distinguish between the blood of animals and humans, it can provide presumptive determinations. For a definitive analysis more serology analysis is required.